We’ve had several requests from people wishing to know more about the content of our FHT accredited Story Massage training day. So here is a ‘fly on the wall’ view of some of our recent training days. Who attends the Story Massage courses? 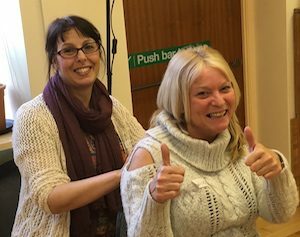 One of the joys of a Story Massage training days is the wonderful mix of people who attend because they feel that Story Massage could make a real difference to the children or adults in their lives – whether at home, school or in the wider community. Sharing information, ideas and support is an integral part of the day. 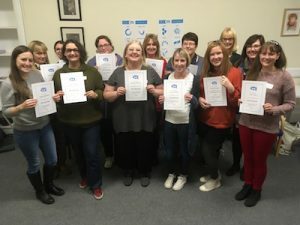 Past attendees have included: holistic therapists, teachers, teaching assistants, physiotherapists, baby massage instructors, MISP instructors, Relax Kids coaches, drama teachers, learning mentors, occupational therapists, care home workers, parents, foster parents – to name a few. The basis of the training is learning the ten Story Massage strokes. We spend time discussing and working with these strokes on each other. There is much lively debate as we consider how the strokes could be incorporated into a massage story to depict an object, emotion or activity. The Circle, for example, could represent the sun, the earth, a pond, dancing or completion. These strokes are all accompanied by a simple symbol. “Once you know the strokes then you can just relax – everything else just seems to follow naturally. That’s the beauty of Story Massage. The strokes are the same but everyone has a different approach. It never ceases to amaze me how appropriate and gentle touch has the power to completely change the atmosphere in a room, even for those watching it.” Vicky Mulholland, Independent Speech and Language Therapist. We allow plenty of time for sharing the many benefits of positive touch in different situations and suggest ways in which you could introduce the concept to others. Safe and respectful touch is at the very foundation of our work, and so working within appropriate guidelines and cautions is essential to good practice. We discuss suggested guidelines for working within your own particular setting. We allow time for any questions that may arise. “ It is one of the best training days I have ever attended. 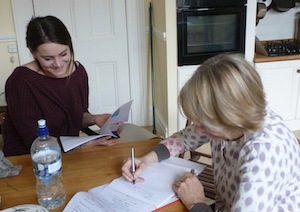 Story Massage is an invaluable tool, quite literally at your fingertips, that can bring so many benefits for children. 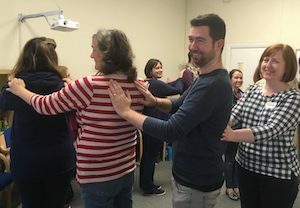 Story Massage gives children an opportunity to show they care for each other and to work on their co-operation skills which for many children in the nurture room can be very difficult.” Charlene Craig, Nurture Teacher, Quarry Brae Primary School, Glasgow. And now you begin to put everything together to form your own massage stories. 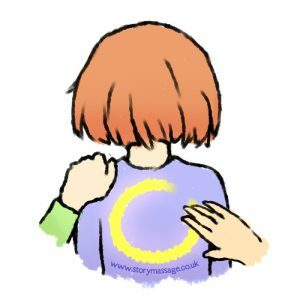 Working in groups we encourage and support you in creating and adapting massage stories either from favourite stories, nursery rhymes or traditional tales, or from your own ideas. Some attendees have made stories for a group of Brownies, a child with additional learning needs, an introduction to the first day at school, or as a birthday surprise for a grandchild. We use our experience and expertise to help you shape your story. “The idea of using your creativity to write stories is a little scary to start with as the desire to ‘get it right’ always prevails. But I’ve learnt that as long as it flows then it is okay, there is no right or wrong. 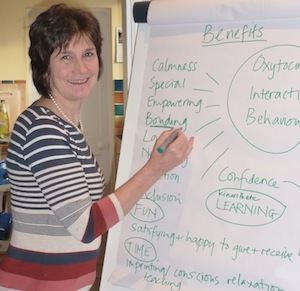 Making it fun for the children and supporting their needs is what really counts.” Ann de Young, Relax Kids Coach. 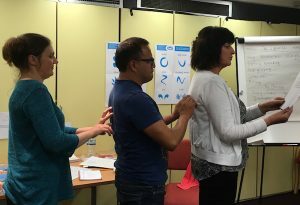 Your group then ‘takes to the stage’ to present your massage story to the others in the course and to share the rewards and challenges of the actual hands-on process of creating the story. This also gives you a valuable opportunity to practice introducing Story Massage to others. As you can imagine, this part of the day is always accompanied by much appreciation and encouragement from others as we work together to help instil confidence in the practicalities of running a Story Massage session. After purchasing the book, I found out about the training sessions on offer. I went on the training sessions as part of my CPD for this year and loved it. It really brings Story Massage to life. The ladies are amazing and so supportive and passionate about their work. 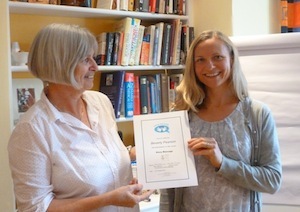 I highly recommend doing the course.” Siobhan Fletcher, Holistic Therapist. At the end of the day we present your certificate and offer support for your continued work with Story Massage. More information about certificates here: Story Massage Certificates Explained. We support your training through our social media platforms, regular newsletter and Facebook Community Page for people who have trained with us. You may wish to purchase some of our resources (Book, DVD, Stickers, Wallcharts and Lanyards) but this is not obligatory. These available to purchase on the training day without the additional postage costs. And if you’d like to hear some feedback from our training courses then please look here: Fantastic Feedback for Story Massage Training Day. For a full list of our training dates please visit Story Massage Training. We look forward to working with you to help spread the wonders of Story Massage. Please do contact us if you have any further questions or visit our page of Frequently Asked Questions.